First I make a local MDS repository. 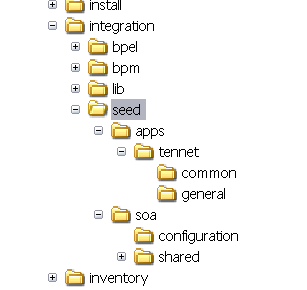 If you install the Soa plugin you already have a seed folder in the integration folder. Under this folder create an new folder called apps. ( this have has to be apps else you will get a permission denied error ) . Under this apps folder we can create our own definitions. Here we can see our common application objects. 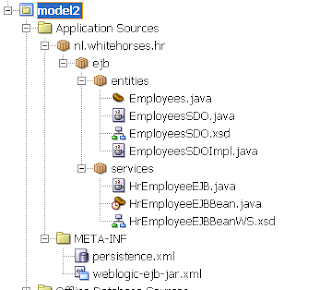 Here we define a new metadata namespace with apps as path. And use the integration folder as metadata-path value. We are ready to use these common objects in a mediator.. 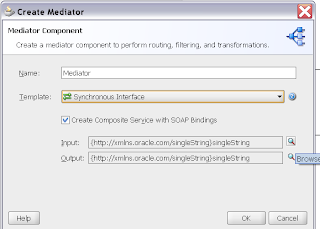 Here I will use a schema from the local MDS as input parameter for the mediator. 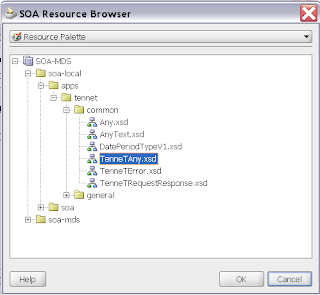 Our Project is ready but If we want to deploy this Soa project, we will receive a error, it can't find the schema. 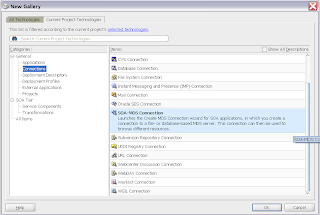 So we need to export the local MDS files to the SOA Suite database MDS. To do this we have 2 options , the first option is to create a MAR deployment ( Application properties ) or do this with Ant. I stripped the Clemens ant project so this ant build file has only two tasks , add and delete. It uses the adf-config.xml ( config folder) for the location of the target MDS and I use the local MDS as source. This will import your local MDS object to the remote MDS. After this you can deploy your Soa Suite project. Here you can download my ant project. Thanks to Clemens. 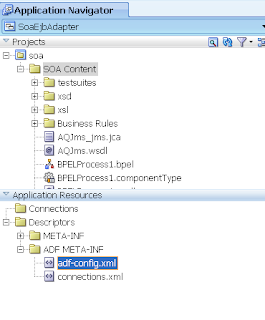 With Fusion Middleware 11G the MDS repository plays a important role for ADF customizations and SOA shared objects. 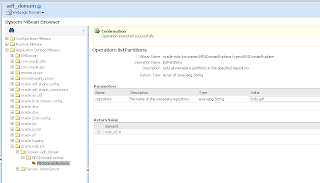 In this blog I explain how you can create a MDS database repository, deploy customizations to this MDS database and what you can do with MDS in the Enterprise manager website. 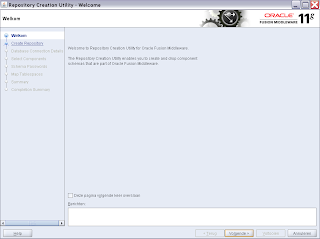 First we need to download the RCU repository creation utility and install a MDS repository in a Oracle Database. 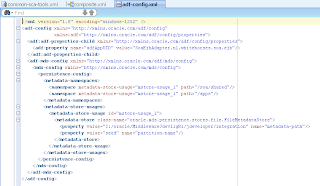 Next we need to install Weblogic with the Soa, Webcenter or Application development runtime extension. This extension gives us the Enterprise Manager website where we can configure the MDS repository. 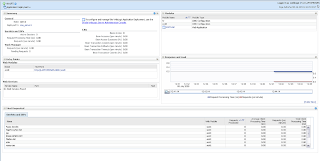 Select your Weblogic domain and select the MDS menu option. The EM website automatically create a datasource which we can use later. When we go back to the EM website we can see the just created MDS partition. The EM website also provides MBeans with some MDS operations. 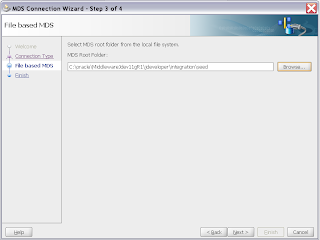 For example we can query the partitions of a MDS repository. 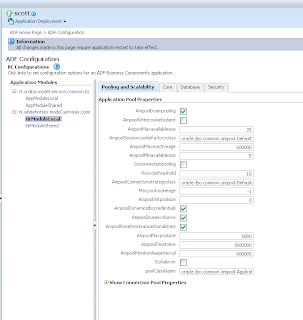 When we select our just deployed ADF application and go to the MDS menu option, we can administer the MDS partition of this application. 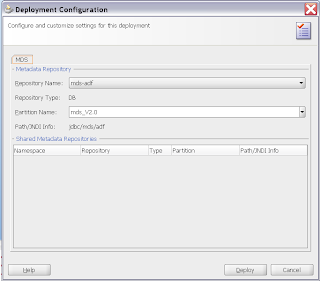 We can export the MDS customization and import this to a different Weblogic server which has the same ADF application. At last we can take a look at the MDS repository, here we can see that all the customizations entries are registered in the database. 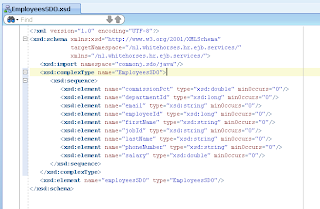 But the customizations xml are still located on the server, a bit strange I would suspect that with a MDS repository in the database that everything is loaded in the database. Here is a picture of the composite application with an EJB adapter as Service and Reference. 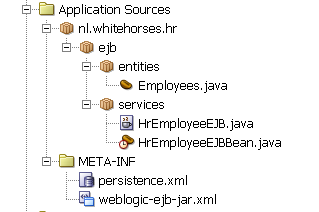 First step is to create an EJB entity with Eclipselink as persistence provider. For this example I used the Employees table of the HR schema. Next step is to create an EJB Session Bean. Here is an overview of my EJB model project. Now it goes totally wrong with the JDeveloper wizard 11G R1. First step is fix the packages names of the SDO and SDOImpl classes, then we can refactor these classes and move it to the entities package. With this as result. 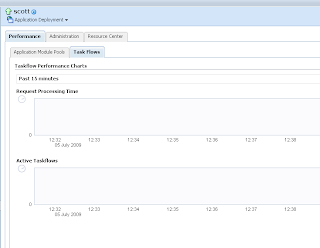 Select the session bean again and generate for the second time the service interface. Now we will get the WSDL. Move the EJB WSDL and XSD to the Session bean package. With this as result. 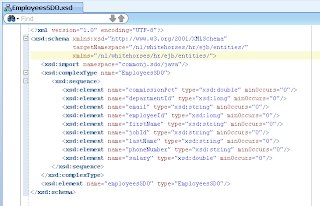 Open the Entity XSD and change the target namespace and xmlns namespace to the same name as the package name in my case /nl/whitehorses/hr/ejb/entities/. 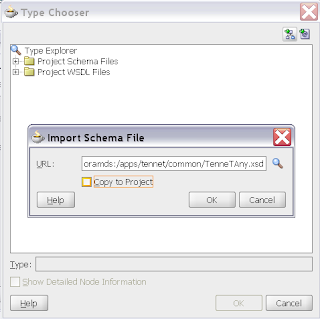 Open the XSD of the WSDL and import the entity schema and fix the namespace. 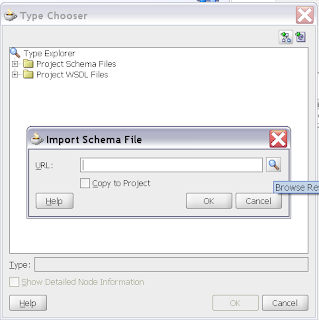 Create a Datasource to the HR schema in Weblogic and make sure you are using the XA Oracle Driver and target this Datasource to the Soa suite server. Deploy the EJB to the Soa Suite instance. Open the composite application and drag the EJB adapter on the reference part of the composite. 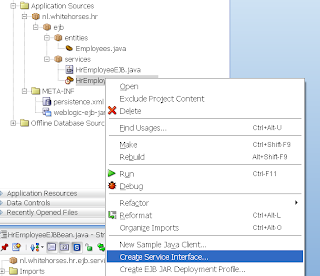 Fill in the JNDI of the EJB on soa suite server , select the EJB jar and provide the Remote EJB interface class name. 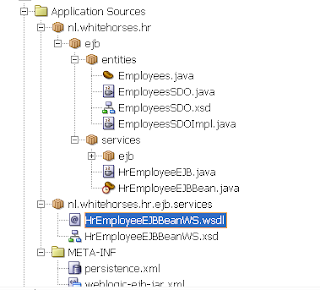 Select the WSDL , Go the classes folder of the EJB model project and select the Session bean WSDL. 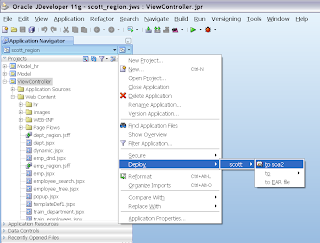 This will copy the WSDL and the XSD to the local project folders and also import the jar. 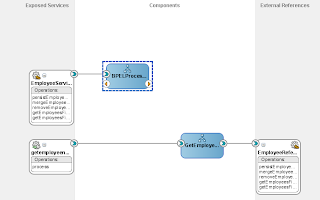 That's all , now you can invoke this in a BPEL process. We can use the same EJB as starting point of our composite application. This time Soa Suite only uses the interface and does nothing with the Session Bean methods. 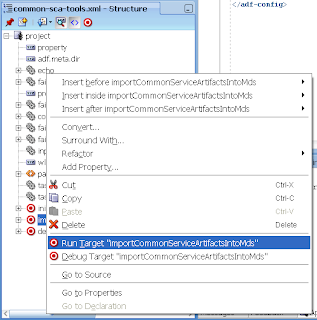 Drag the EJB adapter to the Services side of the composite overview. The Service ID is very important because we need this name in serviceFactory.createService, The rest is the same as in the reference part. 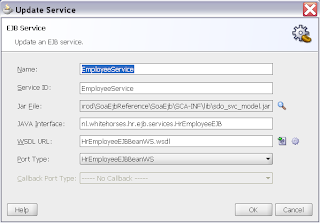 Use this EJB Service in a BPEL process. Now we only have to make a simple java class where we call this EJB composite service. 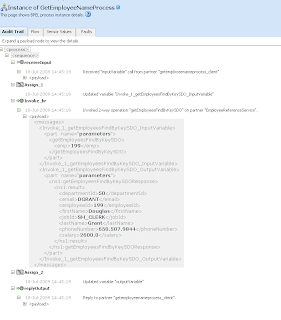 Here is the result of a EJB service instance. Download here the EJB project I used and here the Soa Suite project. In Oracle Application Server 10.1.3 ( OC4J) you can use OJMS to expose AQ with JMS (text) Message as type and use it as a normal JMS Queue or Topic in Soa Suite or a Message driven Bean. See my previous blog for more details. With the release of Weblogic 10.3.1 ( WLS FMW11g ) we can do the same with a Foreign JMS Server. Before 10.3.1 we had to make a startup class to achieve this. 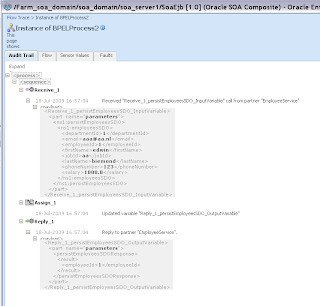 First create a Queue and Queue table with SYS.AQ$_JMS_MESSAGE as payload type in your Oracle Database and make sure you enable enqueue /dequeue on this Queue. 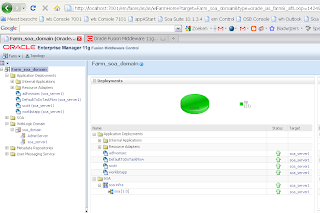 In Weblogic we have to create a JMS server and a JMS module. 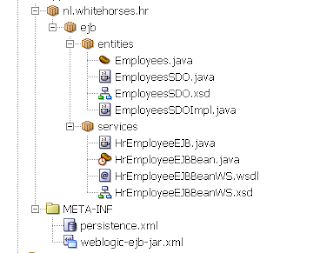 Create a new JDBC datasource with a schema user which can enqueue or dequeue the just created queue. Use the XA JDBC driver, with this driver you can use global and local transactions. 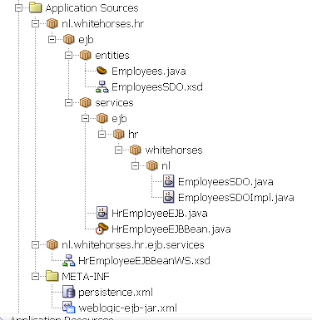 with NON-XA driver you can only use local transactions, this can be problem when you want to use this Queue in Soa Suite. 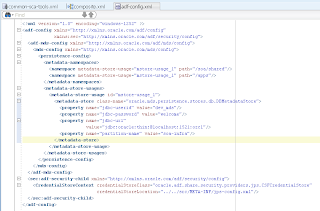 Select your JMS module in the WLS Console and create a new Foreign Server. Open the Foreign Server so we can configure this AQ server. Now we can create a new Destination. 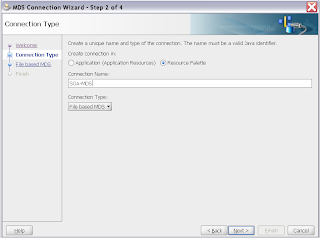 As Local JNDI name you can choose any name but as Remote JNDI it needs to start with Queues or Topics after that add a / with the database queue or topic name. 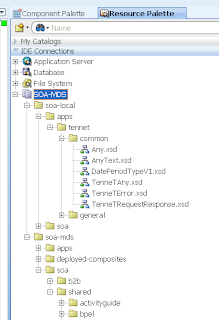 We are ready to use this AQ Queue in a Soa Suite Composite application. Where we will use the JMS adapter. and select the Foreign Server Destination. For more Weblogic AQ JMS details see the official documentation. 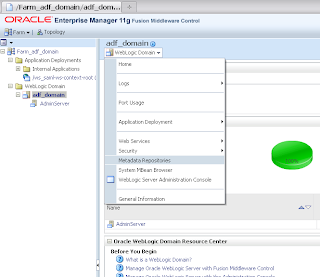 In the release of Oracle Fusion Middleware 11g the old Enterprise manager website is back. And this EM website is the bomb for ADF web applications. ( Well done) . 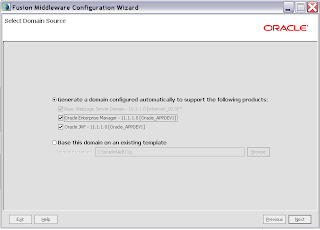 In FMW11g EM you can off course do the standard things like deploy and undeploy, but Oracle added some extra to this site. You can now the measure performance of your ADF BC applications modules, Servlets , Web application and Task Flows. 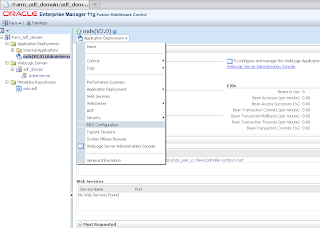 Change or tune the BC4J config parameters , change MDS or security settings ( add WSM policies ) or change the endpoint of your web service client. 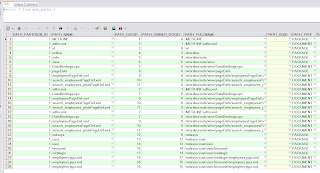 Too bad this EM website is not available in the internal WLS of JDeveloper 11g ( It can be handy for performance tuning). 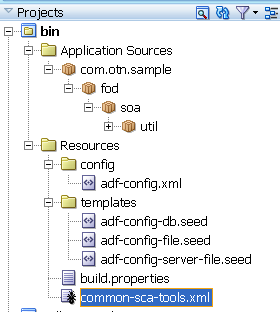 When you want to deploy your ADF application to this WLS server then you probably missing some java libraries. To solve this change your war deployment so the required jars are added to the web-inf/lib. We need to deploy the ear and not the war else the adf connections and security settings are not deployed. You can only deploy the ear from the application menu. 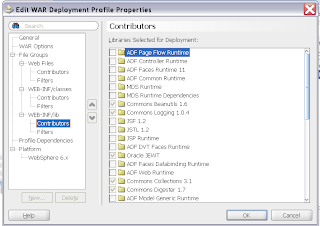 Overview of the deployed ADF application. 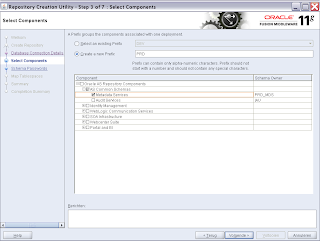 We can change the BC4J configuration properties. My application has a web service client and here we can change the endpoint or add some WS-Security policies. 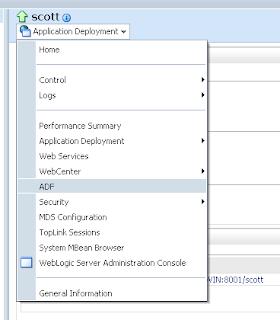 And off course see the total ADF application performance.